Lamb of God, who takes away the sin of the world, look upon us and have mercy upon us. By your agony and bloody sweat; by your cross and passion; by your precious death and burial; by your glorious resurrection and ascension; and by the coming of the Holy Ghost, save those whom you have redeemed, O Savior of the world, who are with the Father and the Holy Spirit, one God, world without end. Amen. Thank You that He became the Sacrifice for my sin, so that by believing in Him I can be redeemed from death and receive forgiveness of sins. 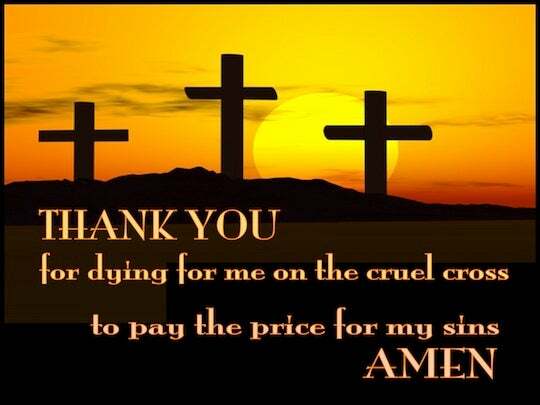 I praise You for the incredible exchange that took place at the cross - He took my sin and gave me His righteousness. He died in my place so that I could live with You forever. Thank You that I have been delivered from the domain of darkness and eternal separation from You and have been transferred in the the kingdom of Your dear Son. Thank You Father, for this wonderful transaction, which is Your free gift of Your grace to all who believe.. and yet a price which cost You so dearly. Thank You that by His punishment for my sin, I have been pronounced righteous in Him and am seated with Him in heavenly places. Dear God, I believe that You sent Your only begotten Son, Jesus Christ, to die on the cross, so that by believing in Him I can be forgiven of my sins, and be redeemed because His innocent blood was shed for me. I believe that it is only through His death on the cross and resurrection that I can be made right with You. I confess Lord that I am a sinner and in need of a Saviour - I believe that Jesus Christ was the sinless sacrifice that died to pay the price for my sins and I believe that He is the only person who is qualified to die for me - for He alone lived a sinless life and died as an innocent victim. Thank You for loving me enough to send Your only begotten, sinless Son to become a Man, so that He could offer Himself as the perfect Lamb of God, Who takes away the sin of the world. 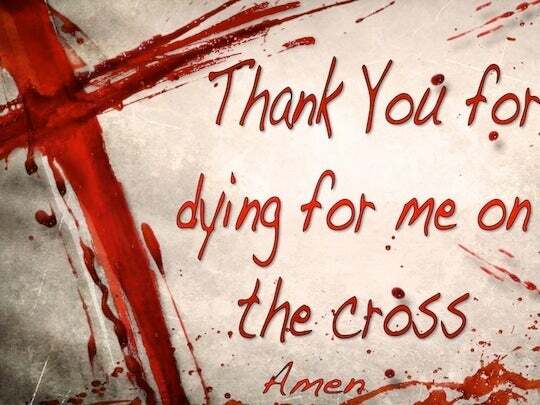 Thank You for loving me and for dying for me.. and help me to live a life that honours You, in thought, word and deed. Thank You that Jesus chose to pay the full price for my sin and that You have accepted His death on the cross. Thank You that He was willing to shed His blood at Calvary, and die on my behalf. Thank You that by His death and resurrection He has washed away all the sin in my life and has cleansed my stained and guilty heart, making it clean and pure.. and as white as snow. Thank You for this wonderful free gift of Salvation and the knowledge that there is nothing left for me to do except to believe in Him as my Saviour. Lord Jesus, I confess that I am a sinner and in need of salvation. I believe that You came to earth to seek and to save people who are lost in their sin and I believe that You died on the cross as the substitute for my sin. I believe that You took the punishment that I deserved for the sins that I have committed and forgave me all my sins. I believe that You died for me and that You rose again from the dead - and that whosever believes in You will not perish but have everlasting life. I trust in You and I place my faith in You and thank You for dying for me, forgiving my sins, making me clean and covering me in Your own prefect righteousness- and I thank You for all that You have done for me. Thank You, Lord, for Your infinite wisdom and Your infinite grace, as demonstrated in the plan of salvation. Thank You for bringing me into communion with You through Your redemptive work. I Prayed For This Prayed for 35 time. I pray for my family to get saved. Please pray that God would grant me salvation and fill me with peace and joy. Pray for my brother David and Gilbert and Bobby that need Salvation My mother passed away 03/11 and they are fighting over her estate and i want God will in their life. Father. My Husband has been suffering with an addiction to meth and infadality.I find it difficult to forgive,now that he is serious about finding help,I'm asking God to heal and stregnthen our marriage. Please pray for healing for my bhroter, Victor. He was diagnosed with brain cancer and needs a miracle. Most importantly he needs prayer for his salvation. Thany you, Deborah Thomas - Lord save Him amen. I pray for Salvation of my entire family, friends and relatives. So help me Jesus! Good health to all of us. In Jesus name. Amen! Lord, help me to believe in you. I know that I need you, but I have a hard time believing. Atheism has a hold on me. I can't escape it. Break the chains that bind my mind. Free my mind to believe. Let me not die before I accept you as my savior. LORD PLEASE SAVE MY FAMILY INCLUDING MY NIECES AND NEPHEWS, THANK YOU. Father God, I ask that in Jesus name, you will deliver unto these people a desire to know you, a spiritual desire that will thrust them into your word. Father I ask that you will deliver unto them your grace, and that through their desire they will come to believe in Christ, and receive your grace. Thank you Jesus for dying for us, so that we may inherit our Father's grace. Thank you for this Day you have given me. Amen. Dear God I know You are coming soon. But there are still a lot of people out there Lord who are lost and have still not found the Way, the Truth, and The Life. Jesus, You are THE ONLY TRUTH, THE WAY, AND THE LIFE. There's no God but You. Help us, Lord, to testify to this world and win As many souls as we possibly can. And may everyone be covered with Your precious BLOOD as the calamities and earthquakes and famines start to occur. Please feed the hungry and starving and hear their cry, and may NO ONE take the mark of the beast. Amen. Lord I pray that I will be able to break through the strongholds keeping Jesus out of my heart. I yearn for the peacefulness and love that I know he provides, yet, not sure if he has given up on me. I know he never would but hopelessness is what I feel at the moment.. In Jesus' name- Amen. I Prayed For This Prayed for 71 time. I pray for healing and restoration of my marriage. Most especially I pray for my husband, that he may know Jesus & may accept Jesus as his Lord & savior. Dear God please help my sons and their families to seek you out,to know you as there savior and to follow you faithfully. Help them to know they need you LORD and they can not live without you. LORD help them to repent and seek you all the days of there life. JESUS name I pray AMEN. Dear Lord I pray for my girl, Elizabeth to find Jesus in the truth and serve Him together with me, for as long as the Lord gives us time here in this world. She is catholic, so she needs to know the true Gospel and come to the truth. Please remember us in your prayers. Dear Lord, Yesterday my mom revealed to me that she is going to commit suicide. On Sunday I called her to ask her to forgive me and she said she was thinking of ways to commit suicide. She wants to see my brother before she commits suicide. I have been praying and praying. Please join me in praying for salvation for this troubled soul. Dear Father in heaven, I ask You for the salvation of my sons. I have been praying this for almost 30 years and I trust You to do it. Lord God abba, please help rudy jr and convict him by the holy Spirit...in your glory and power now and forever....pls help him to know and feel accepted, and that he would trust jesus as his saviour. This is all i ask in Jesus mighty name amen. God send someone to my Dad who is in another country, to help him surrender himself to you. Dear Lord I pray that God continues to heal my Aunt Diane Dodd, and that God will grant my brother Rod to return to faith in Christ. He says he has lost faith and just wants to drink and smoke himself to death. Please pray for our son to return to the Lord - dedicating his life to God's will and service. Healing for my husband's body and soul. Please pray that my husband will become a Christian and that he take me to church. And that he become healed of his prostate cancer or that it does not spread. Please God make my husband to stop drinking alcohol, and smoking ................. And other bad things. Please convict Hmi to come to you to be saved, so he can be a good husband to me. I pray Jesus save me, amen. Dear Lord, I'm a 55 yr old widow with 3 grown kids unsaved on drugs. Please convict them and save them whatever the cost. They were raised for the Lord. I am a glutton lusting for food for every discomfort. Please pray for us .Thank you so much. Dear Lord i lift to you my friend who is not a Christian.I have been endeavouring in the last few months to try and get opportunities to talk to him about Jesus, and how he died on the cross for him. But it's been very hard to get time alone with him. I see a real need for Jesus in his life and would appreciate prayer for him and that God would open the door, and we would get opportunities together to talk. Thank you. Please save him in Jseus name. i want ALL my friends to be saved in JESUS…..